Only one thing will matter when you're dead, and you might die today. "And as it is appointed unto man once to die, but after this the judgment." Eph. 5:25 "Husbands love your wives, even as Christ also loved the church, and gave himself for it." 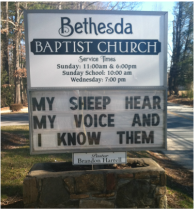 Welcome to Bethesda Baptist Church. We are an Independent Baptist Church located in East Flat Rock, NC. We endeavor to glorify the Lord Jesus Christ through expositional preaching from the King James Bible, evangelism by means of local outreach and world missions, and biblical worship. We are a congregation who understands the centrality of the Holy Spirit and prayer in Christian service. Thank you for visiting our website. You are cordially invited to attend any and all of our services.